Implementing cloud based technology at the work places to manage the human resources has become a common practice these days with the advent of SAP Successfactors. It provides Human Capital Management (HCM) which integrates employee onboarding, social business and collaboration tools. This also includes, Learning Management System (LMS), Recruiting software, performance management and much more. Its applicant tracking system is quite useful for resource hunting. It also includes success planning, talent management and HR analytics to deliver business strategy alignment, team execution and maximize individual and team performances. All these solutions are cloud based and are easy to implement and capable of growing with the growth of any organization. 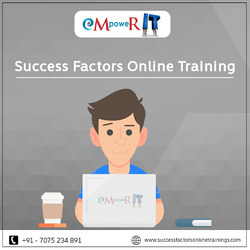 eMpoweR IT is offering an online training programme in various modules of SAP Success Factors which includes Introduction to mastery and Employee Central which would be for the duration of 50 to 60 hours. Next Course includes modules like Performance Management, Goal Management, Compensation Management and Workplace Analytics. The duration of this course also would be for 50 to 60 hours. The final course includes Recruitment and Onboarding the duration of which is also for 50 to 60 hours. To know more details regarding the course structure and the faculty experience visit www.successfactorsonlinetraings.com.